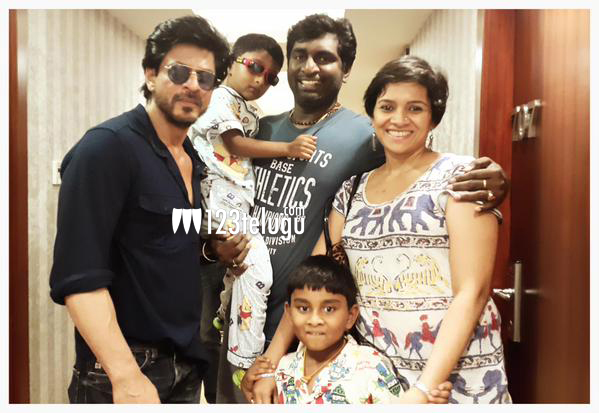 Bollywood Baadshah Shah Rukh Khan has been shooting for his upcoming film, Dilwale, in Hyderabad from the past few days. Last week, the makers of the film roped in Tollywood’s noted cinematographer,Senthil Kumar, to can shots for a song in this film. The song shoot has been wrapped up in RFC and Senthil Kumar is quite happy for having worked with the team and felt this short journey as a learning experience. In the above picture, Shah Rukh is seen sharing a lighter moment with Sentil Kumar’s family.